The massive three story brown brick building to the west of the Jackson Street Pier is now the Chesapeake Lofts, home to luxury condominiums offering a splendid view of Sandusky Bay. However, in its previous life a portion of the building housed shops and the famous Norman Hall. Later it was a manufacturing facility for corrugated paper boxes and other products. 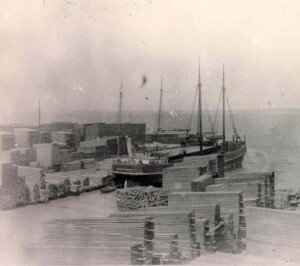 This is the Jackson Street dock. Norman Hall was probably the first structure built in Sandusky primarily as a theater and concert hall. The building was constructed in 1855 on Water Street. The Hall itself was on the second floor, while the first floor was home to several and varied storefront businesses. April 1, 1861 – Upp Brothers Wholesale Dealers in Salt Fish of all kinds, Salt, Waterlime, Land and Calcine Plaster, Hams and Shoulders, Family Vinegar, lake Ice, &c. Store Room Nos. 234 and 236, (first door west of Norman Hall) Water Street. Thumb, whose real name was Charles Stratton, boasted he and others like him would be at Norman Hall. They had just returned from Europe, where “they appeared before nearly all the kings, queens, emperors and nobility of the old world. January 24, 1884 – Roller Skating – The above popular amusement has been revised for this week only and the Social Turner’s Hall (formerly Norman Hall) presents its old time lively appearance. The floor is in splendid condition and for an evening of enjoyment, go to the Roller Rink. Admission 25 cents. Skates 10 cents. October 7, 1891 – New Cigar Factory – Mr. John Witworth has leased the old Norman Hall building on Water Street to Hautzenraeder & Co. of Mansfield for a cigar factory. The firm employs 300 hands at its factory in Mansfield and the business sin this city will be operated as a branch with probably 150 employees, mostly girls, who will prepare the leaf for use at the main factory. A large number of girls have already been employed as a result of the advertisement which appeared in the Register yesterday morning and the parties who have leased the building will come here next week to begin active operations. 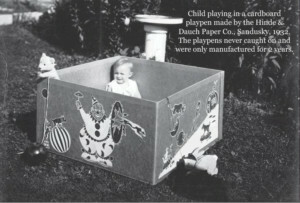 HINDE & DAUCH PAPER CO. In 1886, first generation local farmers James J. Hinde and Jacob J. Dauch saw an opportunity to enter the paper making business when a customer for their baled straw went bankrupt. 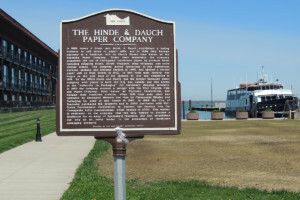 Hinde and Dauch Paper Company (which no longer exists) rented the building in 1897. 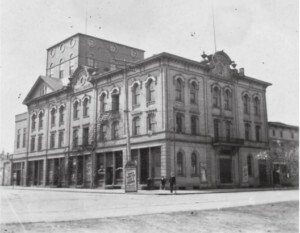 The building and neighboring buildings were incorporated into a five-story building, ending its days as a performance hall. Hinde proved to be an excellent businessperson, developing a process to manufacture corrugated cardboard packaging materials. At the time, companies faced a major challenge in shipping more fragile goods. Hinde’s new packaging helped to solve this problem. The company grew quickly and became very successful. June 2, 1870 – The practice of bathing, by men and boys, in front of many of the docks during almost every hour of the day, is an indecent nuisance. Complaints are rife that ladies are obliged to keep away from the shores of the Bay, and the eve is becoming intolerable. It is the duty of the City Marshall to take notice of this matter, and enforce the ordinance by arresting offenders. Hinde left the company in 1910 to pursue other interests, but Dauch continued to run the company and in 1918 centralized the company’s manufacturing in the building you see here today. Dauch died unexpectedly on August 16, 1918 in an automobile accident. 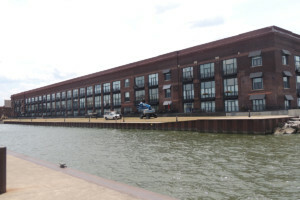 The land east of the building was sold by his heirs to the City of Sandusky and today is the location of the Jackson Street Pier. In 1953, Hinde and Dauch merged with the West Virginia Pulp and Paper Company to form the Westvaco Corporation. The new company operated the facility until 1981, when it was closed and was ultimately donated to the City of Sandusky.